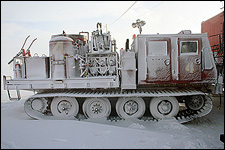 The Antarctic Fire Department is proudly supporting the advancement of world science through	fire/rescue support services on the highest, driest, windiest, coldest, and ultimately harshest continent on the planet - Antarctica. 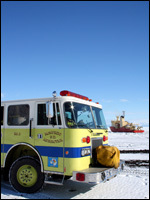 Based on Ross Island, the AFD provides the United States Antarctic Program with professional emergency services at McMurdo Station, Amundsen-Scott Station, and the United States	Air Force airfields. Antarctic Fire operations are performed where the most extreme environmental conditions on earth exist - south of 60° lattitude. With the extreme temperatures and working conditions, it takes a special person to work in the Antarctic environment as a firefighter. As such, the AFD prides itself on having the most diverse, dedicated, and resilient personnel of any fire department in the world. The department offers the unique opportunity to go where few people have gone before, or ever will go. Antarctica is one of the few places on earth that remain unscathed from permanent human population/presence and wields a serene beauty that is beyond words. Working in Antarctica is challenging, but ultimately rewarding as well. While deployed, firefighters learn vital skills that educate and protect them from the Antarctic environment and also help them understand and preserve the pristine eco-system they work around. Employment opportunities include short and long-term positions ranging from Firefighter/EMT to Firefighter/Medic, line Lieutenant, Shift Captain, and Emergency Dispatcher. We welcome and invite	you to look around and learn more about Antarctica, the department, life on "the ice," and the opportunity of a lifetime that awaits you.